Eighteen is the magic number. That is the age when the youngest portion of this boisterous group of young adults leading the national conversation about gun control will be able to vote. 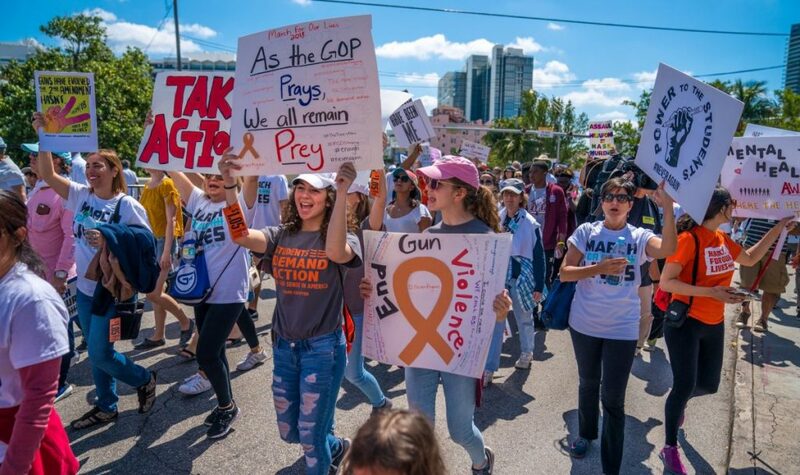 University of Miami senior Maya Lubarsky sees that as the ultimate leverage – the people who have grown up in a post-Columbine, post-Parkland world are or will be constituents, and they will be able to hold politicians accountable. 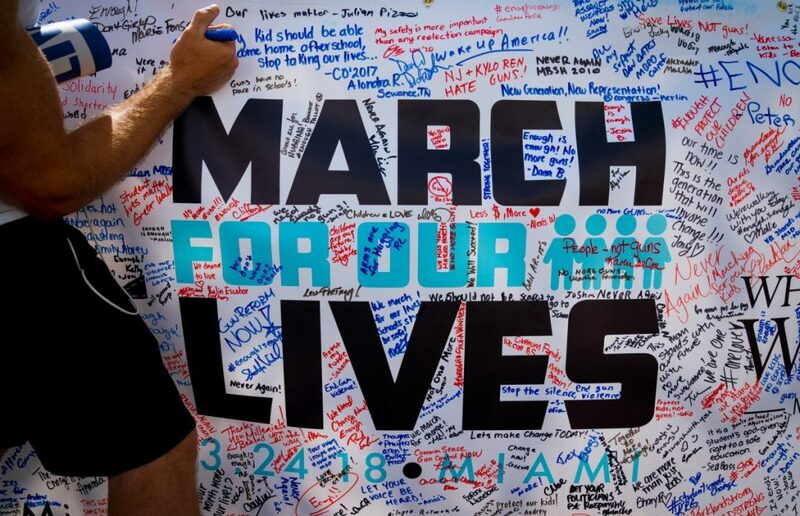 An estimated 4,500 people took to the streets of Miami Beach for March For Our Lives Miami, the event led by University of Miami and Miami Beach Senior High School students. The thousands gathered to advocate for new regulations on gun accessibility and to call on younger generations to make sure elected officials hear their voices at the polls. March For Our Lives Miami was a sister march to the one in Washington, D.C., which was organized by the students of MSD following the Valentine’s Day shooting that left 17 dead and more than a dozen injured and shocked the South Florida community. On March 24, nationwide and around the world, more than 840 organized marches and rallies took place. The outcry and push for new legislation was born after MSD became the scene of Florida’s deadliest school shooting. 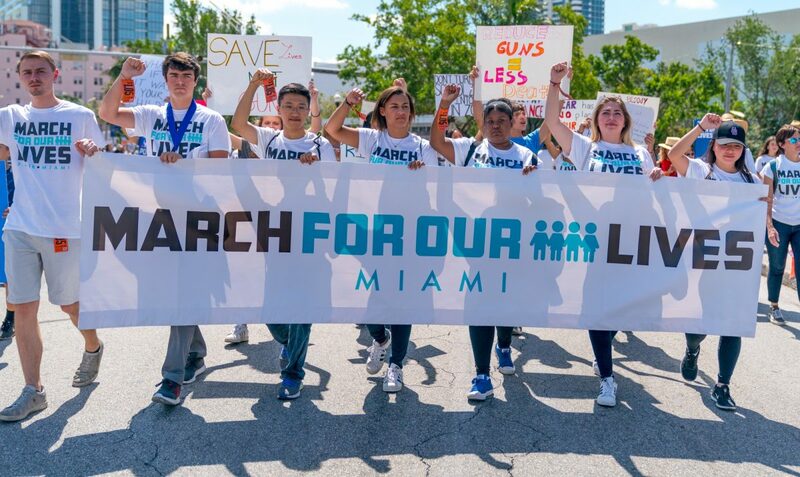 Four MSD alumni, now UM students, teamed up with students from Miami Beach Senior High School to create the Miami Beach march, providing an example for others in their generation to take action against gun violence. Lubarsky, a neuroscience major, was one of the four UM students who coordinated the event. Though she said the event is “realistically” not going to change anything immediately, it does send a message to politicians. “This really shows our country what we – as the young adults and community members – what we want,” Lubarsky said. UM offered free buses to transport students to the event in Miami Beach. The ride-sharing company Lyft committed to offering free rides to those attending marches throughout the country. Lyft said it would put a total of $1.5 million toward free rides. Senior Marisa Goldman, who handed out shirts to the students loading onto buses at Stanford Circle, said 85 students had registered out of the 100 slots available. Goldman, a 2014 MSD alumna who took the bus to Miami Beach, said she’s not shocked by how the MSD community has responded to the shooting. The march began at 10 a.m. at Miami Beach Senior High School. 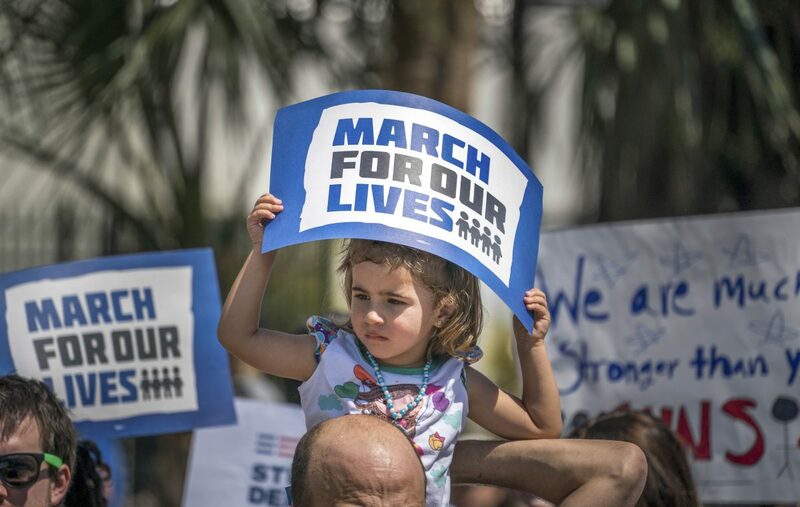 There, thousands of participants flooded into the empty parking lots in front of the school with signs taking aim at President Donald Trump, Florida Sen. Marco Rubio and the National Rifle Association – names heard throughout the march and rally. Several of the event’s coordinators and local public figures addressed the large crowd to explain how 6 1/2 minutes, the estimated time it took for 19-year-old gunman Nikolas Cruz to kill 17 people, changed their lives and community forever. She had no idea that in a little more than three months, her hometown and alma mater would become the scene of yet another massacre. Manning told the crowd that when she heard the news of the shooting, she began to shake uncontrollably. Manning said she couldn’t grasp that the very same town she called home, her safe haven, was now the scene of the deadliest school shooting since Sandy Hook in 2012. Manning, choking back tears as she addressed the thousands at the march, said she knew people who were directly affected by the shooting even more than she. Nearly a dozen speakers took the stage for 30 minutes before the march began. 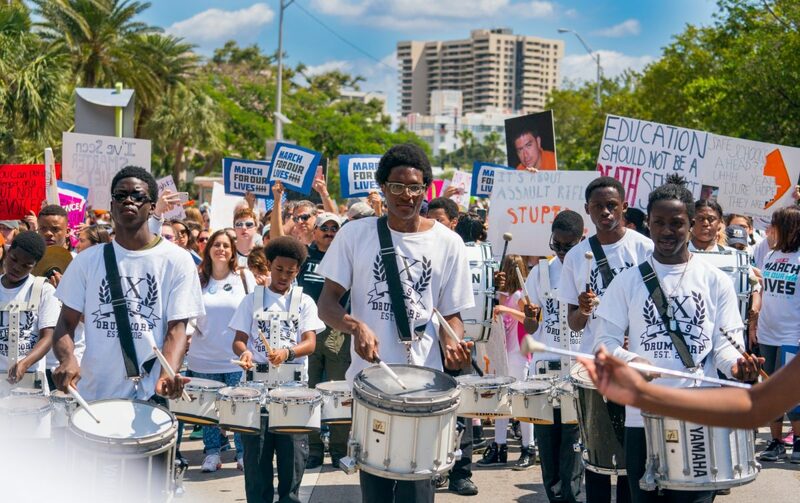 At 10:18 a.m., marchers, lead by the Miami Beach Senior High School marching band, made their way to Collins Park in Miami Beach for a rally. There, a slew of other speakers, including shooting survivors, local politicians such as Mayor of Miami Beach Daniel Gelber and surprise guests Flo Rida, Emily Estefan and Jo Mersa Marley, all took the stage to address gun violence in the United States. Each of the speakers encouraged young people to exercise their right to vote and hold their elected officials accountable. One Miami-Dade County public figure even apologized for his generation’s inaction. “I am sorry we have not done enough as a nation to protect the young people of today,” said Alberto Carvalho, Miami-Dade County Public Schools superintendent. About two weeks after the Parkland shooting, Carvalho turned down an offer, that was thought to be finalized, to become the chancellor of New York City schools. Carvalho said he would stay in Miami-Dade. Now, older generations are taking a cue from the younger ones. Karen Shamuel, a Miami Shores resident, held a sign that had “Flower Children Support Power Children,” written on it as an homage to hippies and the counterculture movement of the 1960s. Shamuel, a former trauma nurse, said the March For Our Lives movement happening in the country right now led by a younger generation is necessary to create lasting change. Throughout the march, hundreds of parents marched alongside their children. Some, with their children on their shoulders, are hoping they’re part of the change that leads to their children coming home safely from school each day. Allister Roper, a Hollywood, Florida resident, said he made the drive down to Miami Beach in hopes that the march becomes his 1-year-old daughter’s first baby step to political activism. Roper, 49, said the March For Our Lives movement is a “necessity” to change what is “going on in the world today.” Roper compared gun violence and mass shootings to a runaway train that would not stop with politicians not doing anything to derail it. While MSD students who survived the shooting are taking the lead nationally against gun violence, Manning said college-aged students should also be involved and lead future generations in the fight. Manning said activists as young as elementary school kids have taken part in the movement, but it’s up to college students who are old enough to vote to set an example.